While the cabbage is cooking, prepare the cheese sauce. In a separate saucepan, melt the butter over medium heat, about 45 seconds. Whisk in the cream cheese and heavy whipping cream until smooth, about 1 minute. The sauce will start to form bubbles, continue whisking and reduce heat to low. Quickly stir in the shredded cheese and sprinkle with salt and pepper. Turn off the heat and continue stirring until all the cheese is melted and the mixture is completely smooth about, about 1 minute. It will be about the thickness of melted Velveeta or queso. 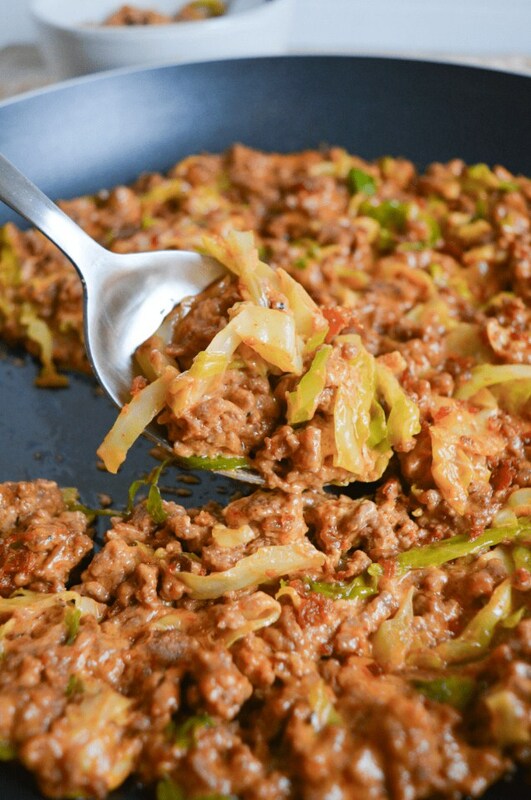 Once the cabbage is tender, pour the cheese sauce into the skillet and fold into the ground beef mixture. Remove from heat and top with crumbled bacon, if desired.